Does the excess skin hanging over your upper eyelids make you look older and sadder than you feel? Do you have bags or puffiness under your eyes making you look constantly tired? You’ve tried numerous eye creams advertised to “drastically reduce” the puffiness and wrinkles around your eyes; you’ve pulled at your lids and applied eye shadow in strategic ways; you’ve tried cold cucumbers, and other home remedies; but nothing seems to help take the years away and bring back the youthful, cheerful eyes you once had. Our experienced and board-certified plastic surgeons at Celebrities Choice can give you a more youthful, cheerful, and attractive look by performing an upper and/or lower eyelid lift (Blepharoplasty). • Removing the unsightly excess skin of your upper eyelids. • Removing protruding excess fat and smoothing out your upper eyelids. • Removing excess fat to reduce/remove bags. • Tightening the skin of the lower eyelids. 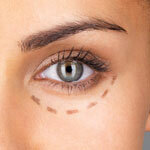 Eyelid lifts are often combined with a facelift and/or a brow lift to save you recovery time and money. However, our consultants will listen to your concerns and honestly assess surgical and non-surgical options to create a customized procedure just for you. Call us at (407) 629-4100 or send us an email at Contact@CelebritiesChoice.com. We will answer any introductory questions you may have and can schedule a private consultation for you with one of our board-certified plastic surgeons at Celebrities Choice in Orlando, Florida. You will feel at ease with our honest consultants as you review your options and become educated on the benefits and risks of cosmetic surgery. Our surgeons are extremely knowledgeable and experienced with surgical and non-surgical options, and will take time to help you determine what is required for you to look and feel your best.